Series FAW wide range input (85-264V a-c) accommodates mains power everywhere without a selector. UL recognized, CSA certified and approved by TÜV. Onboard VDE 0871, level B EMI filter. Power OK logic. Optional metal enclosure. FAW can be individually installed as open frame or optionally enclosed power modules, and are DIN rail mountable. 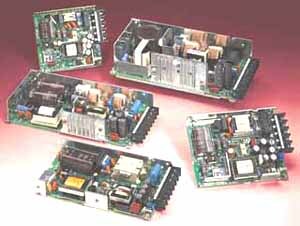 They may also be combined into a custom power assembly for multi-output requirements. FAW 100W Models are no longer available. Availability is limited to factory stock for 25W, 50W, and 150W models. Modern replacements for FAW are available. To make the transition to our latest power supplies easier, Kepco's mounting adapter plates allow the use of existing mounting holes (no drilling needed) - ideal for field replacements and upgrades. If you do not find the one you need, contact Kepco. Factory installation for FAW DIN Rail mounting is now UL508 Listed (cULus) as Miscellaneous Apparatus: Open Frame Type for use in Industrial Control Equipment. FAW are CE Marked per the Low Voltage Directive (LVD), EN60950.